The sandwich is the great equalizer. A simple food—two pieces of bread with something in between—that puts everyone on equal footing. Every culture has a version of the sandwich and we all, even writers, eat them. But where does a National Book Award-winner satisfy their pastrami craving? Does an emerging poet prefer wheat or sourdough? What sandwich did your favorite novelist carry to school each day in a brown paper bag? 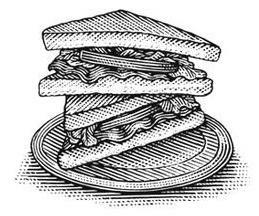 I began to find the answers to such questions when—with what began as a joke of sorts, a conversation starter with writers I'd met back in graduate school—I asked: “What’s your favorite sandwich?” (Because how many times can we discuss process?) I quickly discovered that each sandwich is as unique as the writer that eats it. We often forget in that moment of awe when finishing a book that there’s a person on the other side of those beautiful pages. But this project—where I ask writers (over 150 currently) to divulge their favorite sandwich, and then either I make it or visit the restaurants where they eat them—hopes to change that. The writers we love and admire are genius, but they too are flesh and blood, with grumbling stomachs like you and me.